Kinesis Health Technologies is a spin-out from University College Dublin (UCD), develops products that help prevent falls in older adults using wearable sensor technologies. Kinesis QTUG™, a Class I medical device, based on 9 years of research, is used by healthcare professionals to improve their ability to identify those patients at risk of falls and to prescribe an intervention, to quantify a patient’s response to therapy and rehabilitation, and to assess patients for neurological disorders. At the Tech Day event, entitled Technology and Ageing – Innovation for Independence and Innovation, Kinesis pitched against a number of leading start-ups, from around the world working in the ageing technology space, and won a $4,500 (€3,900) prize. After winning, Seamus Small, CEO and co-founder of Kinesis Health Technologies said, "We are delighted to have won the Tech Day pitch competition at such a prestigious international ageing conference. 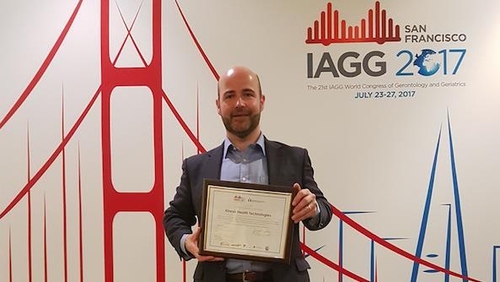 This prize provides great recognition for the Kinesis team and provides further external validation of the value and impact of our products to the global ageing care market."